Hancock County Sheriff Scott Kane discusses the contract for dedicated patrols in Stonington during a selectmen’s meeting on Monday. Photo by Rich Hewitt Order prints of selected PBP photos. That was the short answer Hancock County Sheriff Scott Kane gave to selectmen Monday night. The question was whether a two-day contract for extra sheriff’s department patrols in town would be available if the town reduces the amount it budgets for police coverage. “No. I will not be able to offer you a contract for two days,” Kane said. That would mean there would be no deputy assigned on a regular basis to patrol the town beyond the normal coverage provided jointly by the sheriff’s department and the state police. Furthermore, Kane said, he could not guarantee there would be deputies available to cover the three large annual celebrations in town: the Fourth of July, Fishermen’s Day and the Boat Races. The town currently budgets about $74,000 to cover the cost of a contract with the department for three days of patrols. During budget discussions last month, selectmen opted to reduce that budget line to $50,000, an amount they calculated would pay for two days of patrols. They reaffirmed that decision on Monday when they adopted a 2019 town budget with the $50,000 figure in it for police coverage. Voters at town meeting will be able to change that amount, if they choose. Technically, the one-year contract with the sheriff’s department ended on December 31. But the department has regularly continued to operate under the contract terms each year until town meeting when new funds are approved. Kane said that will hold true this year and that deputies will continue to patrol three shifts until this year’s town meeting in March. Kane said he would like to see the contract for three shifts a week continue, but told selectmen that a two-day contract was not financially feasible for the department, based on the high costs involved in training an officer. The three-day contract, he indicated, is the minimum that would justify hiring an additional deputy for the department. Kane also said that if the town rejects a three-day contract this year, it probably won’t get another one in the future. There are “pitfalls,” Kane said, if the town meeting adopts the lower amount, uncertainty being one of them. Currently, he said, he assigns deputies to three shifts in Stonington each week. The coverage is guaranteed. Without a contract, any request from the town for additional coverage would be posted and deputies could choose whether to sign up for those shifts. In addition, the cost of coverage goes up. 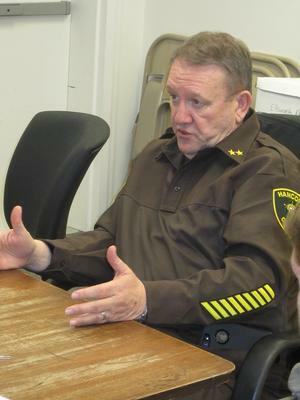 Since deputies sign up for the shifts in addition to their regular patrol duties, the town would be billed at the overtime rate, Kane said. Selectman Travis Fifield asked whether the schedules could be arranged so the town could get less coverage in the winter when there is little activity in town and more in the summer when it is busy and the coverage is needed. “Would it be possible to focus on four months of the year when potentially we could use more than three days?” Fifield asked. Kane said he understood the town needs the help in the summer, but said he could not schedule his deputies that way. “You want him for four months, but I have to employ him for twelve months,” he said. Although the increasing cost of the contract was a concern and the selectmen had some questions about the department’s billing, the chief factor for the board appeared to be the effectiveness of the sheriff’s patrols in town. They aired some of those concerns with Kane on Monday, urging more patrolling and less parking. Town Manager Kathleen Billings raised concerns about speeding and encouraged Kane to have deputies patrol where the problems occur. “You can’t get them sitting out behind the RLDS Church,” she said. Donna Brewer agreed and urged Kane to patrol early in the morning on Route 15 where, she said, motorists regularly speed by her home. Although the selectmen have included just $50,000 for policing in the 2019 budget, that amount can be changed at town meeting. Despite the cautions from Kane, Selectman John Robbins suggested leaving the budgeted amount at $50,000. “I’d say leave it there and let people increase it if they want to,” Robbins said. Selectmen have not yet signed the warrant for town meeting, which is set for March 9, but Billings said the warrant article will ask what amount the town will raise and appropriate and carry only a recommendation of $50,000 from the selectmen, so that voters will have the opportunity to change the amount.